Devices - this page shows the details about the devices currently connected to your router. For each device, it shows its name, MAC and IP Address information, and how it is connected to your router. • Refresh - re-displays the most current information. • Open in browser - displays the information in a web browser. • Print - prints the information currently displayed. • DHCP client table - lists all wired and wireless computers and devices connected to the network, clicking this button will view the current DHCP client list. To set up DHCP reservations, click here. This tab contains several tools that can help diagnose and troubleshoot problems you may be having on your home network. NOTE: Checking the Diagnostics tab is helpful when speaking with a Linksys Technical Support representative. Below are the tools available under the Diagnostics tab. Why call for Tech Support? Calling for tech support is important for users that are not familiar on how to diagnose connection problems with the router. Typically you won't use this page unless instructed by a Support representative and guide you in using these tools. Ping IPv4 - is a common tool when troubleshooting communication problems on a network. To learn more about this tool, click here. Trace route - is used to "trace the route" across an Internet network from your home router to a remote location specified in the IP or URL address box. For instructions on how to perform trace route, click here. Router configuration - this allows you to save your current router configuration settings and to retrieve a previously backed up configuration. To configure the backup and restore feature, click here for step-by step-instructions. NOTE: This option is available only when you're connected to your home router. 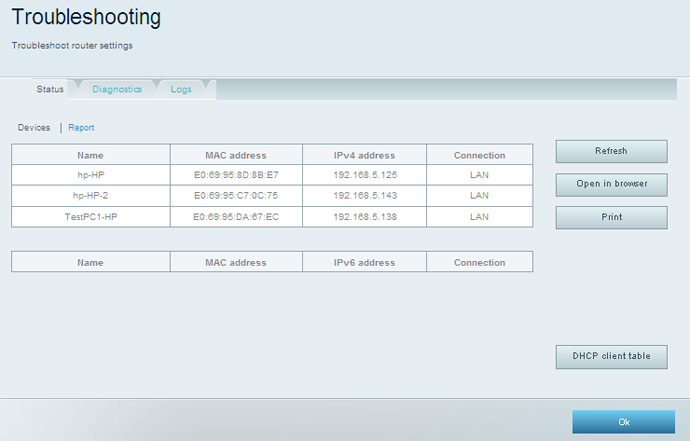 WAN IP Address - this shows the current WAN IP Address. Click here for instructions on how to check your WAN IP Address. Reboot and Factory reset - these options will allow you to power your router OFF/ON or reset your router to the settings. For instructions, click here. • Clear - clears the current information in the log. You should now be able to determine the ways you can check network information and perform diagnostics that you need for troubleshooting purposes. If there are no other network issues found upon using this tool, you can proceed in connecting your wireless electronic devices to your Linksys Smart Wi-Fi Router using your Linksys cloud account. To learn how, click here.